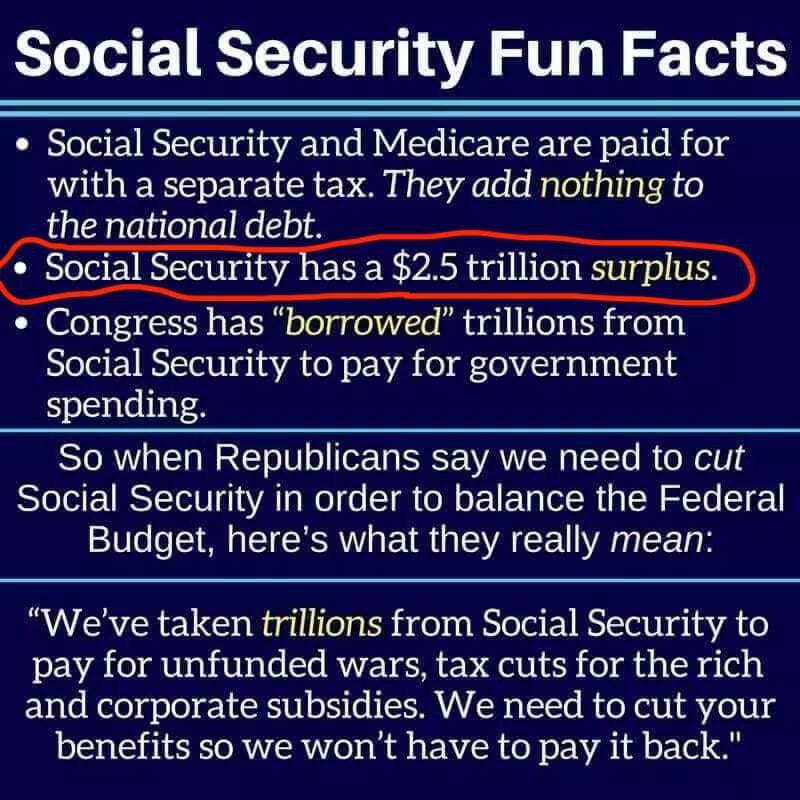 Does Social Security have a $2.5T surplus? Is the freehand-circled claim true? Does the United States Social Security have a surplus of $2.5 trillion? Also, if the above is true, how did SS accrue this much extra? "Asset reserves" were $2,891.8 billion at the end of 2017. The "net increase in asset reserves in 2017" was $44.1 billion. The asset reserves of the combined trust funds were $2.9 trillion at the end of 2017. The trust fund reserves decline on a present value basis after 2017, but remain positive through 2033. However, after 2033 this cumulative amount becomes negative, which means that the combined OASI and DI Trust Funds have a net unfunded obligation through each year after 2033. Through the end of 2092, the combined funds have a present-value unfunded obligation of $13.2 trillion. Starting in 1983, Social Security increased revenues (i.e. taxes), raised the retirement age for future beneficiaries, and adjusted spending. It is now over thirty years later and that surplus has been accruing interest over time. Less than $100 billion a year is not so much in the context of Social Security, which currently spends $988 billion per year (2018). Currently the trust fund has more than the $2.5 trillion claimed. Social Security statistics. Throwing those numbers into a spreadsheet, I found that Social Security has collected more than $2 trillion as interest since 1983. The idea was to prepare for the retirement of the baby boomers, who were born in 1946-1964. They started retiring on Social Security in 2008 (at age 62). The last will start in 2035 (at age 70.5). Perhaps not coincidentally, the Social Security trust fund is projected to run out of money in the early to mid 2030s. At that time, the trust fund would be covering about 25% of benefits. Almost forty years of Social Security saving spent in less than twenty years. Source: 2018 OASDI Trustees Report. For a contrarian answer, I rate this as false. At least the mechanism of how the SS Trust Fund works should be considered in giving a full and honest answer to this question. The Social Security trust fund is merely an accounting device filled with IOUs that future taxpayers must repay. Not only is any surplus gone, the principal balance is gone as well. All future outlays from Social Security will have to be financed on the future taxpayers or more debt. They do not consist of real economic assets that can be drawn down in the future to fund benefits. Special they are: They are worthless. As the OMB explained, they are nothing more than "claims on the Treasury [i.e., promises] that, when redeemed [when you retire and are awaiting your check], will have to be financed by raising taxes, borrowing from the public, or reducing benefits or other expenditures." That's what it means to have a so-called trust fund with no "real economic assets." If the pyramid of those currently paying taxes (the base) shrinks or even becomes more rectangular, say to people living longer, the promise to pay by the US Federal Government becomes a broken promise. I don't think anyone can gainsay that this is at root a pay as you go program, and the idea that there is a surplus is anywhere is kind of a slight of hand. The beauty of social insurance is that it is actuarially unsound. Everyone who reaches retirement age is given benefit privileges that far exceed anything he has paid in — exceed his payments by more than ten times (or five times counting employer payments)! How is it possible? It stems from the fact that the national product is growing at a compound interest rate and can be expected to do so for as far ahead as the eye cannot see. Always there are more youths than old folks in a growing population. More important, with real income going up at 3% per year, the taxable base on which benefits rest is always much greater than the taxes paid historically by the generation now retired. …A growing nation is the greatest Ponzi game ever contrived. In conventional media accounts, the trust funds will “run out of money” when the lines on the graph in Figure I cross the x-axis and become negative. This will occur next year for the Disability program. For Medicare Part A, it will occur in 2030. For Social Security retirement, it will occur in 2035. Of course, there is no “money” to run out of. But those are the dates in which Congress and the President must act. If they fail to act, the Treasury will be required to reduce benefit payments to the point where they equal the income (taxes and premiums) into each of the programs. Others have posited that the true size of the unfunded total liability is closer to $100 trillion. Do casinos have a negative economic and social impact on the neighborhoods they are located in?